Traveling to a new country can be exciting, but there are a few things you should do in order to avoid being perceived as rude or insensitive. Splitting your bill in America is quite normal, but in other countries such as London and India, it is frowned upon. Don’t expect that everyone will speak English, or that you’ll have all the same luxuries abroad as you do in the US. Any time you’re traveling to a new country, it can feel like you’re going through a whirlwind of emotions. Though excitement may be the one that you relate to the most, something that you may not think about or prep yourself for is how to avoid offending those whose country you are planning to visit. There are many things that seem normal or traditional in American culture that can be viewed as rude or insensitive in other countries. The question of whether or not you should be tipping in foreign countries is most notably discussed, but what about all of the other “mistakes” that Americans neglect, skip over, or just don’t know about? Whether you’ve already got your trips planned for this year or are looking to make a few new stops, here are 14 things you should keep in mind when traveling abroad. Expecting everyone to know English. Ask before talking to someone. Just because it’s the only language you know doesn’t mean that everyone else knows it, too. In order to avoid offending those whose country you are in, traveler Viviana Werner — who has traveled to over 30 countries — advises politely asking whether or not someone knows English before talking to them. Not taking religion and cultural sensitivities into consideration. Being sensitive is more important than getting a good photo. Sometimes the outfit that will look cutest in your Instagram isn’t necessarily appropriate to wear to the attraction you’re visiting. The religion and cultural practices of a country are far more important than you nabbing that cool picture for Instagram. Only researching one part of the country you’re visiting. Don’t paint all of the country with the same brush. When traveling, it’s important to not only inform yourself about the tourist sites you’ll be visiting, but also the area you’re visiting as a whole. Alyssa Shanelle, who is of Jamaican descent, told INSIDER that not doing your research is one of the biggest mistakes you can make while traveling. Every experience is only as good as you make it. Be sure to make yours the best possible. Haggling too much when shopping at local markets. Don’t insult vendors by negotiating too much. Werner, who visited Mexico recently, told INSIDER that Americans have a tendency to try to get a lower price when shopping in other countries. Just like you would like to be paid fairly for your services at work, those who work in local markets expect the same. Being ignorant of a country’s culture. Try to appreciate how the locals live. Even with a bit of research, there are still things that you won’t find out about a country until you get there. Devika Maharaj, who lived in Trinidad and Tobago, told INSIDER that Americans tend to become disappointed by their experiences in foreign countries because of this. It’s best to be as open-minded as possible when visiting a foreign place. Being overly friendly and outgoing. Sometimes it’s better to keep a low profile. Southern hospitality may be appreciated to those who live stateside, but when traveling abroad, it can often be looked at as being a little too aggressive. “I’ve found that the southern hospitality or polite friendliness that I took for granted growing up can come off as invasive or even suspicious in other parts of the world,” traveler and journalist Sarah Bunton-Lauer told INSIDER. “Smiling at strangers in foreign places can be off-putting, however, it’s a hard habit to break. This has happened multiple times for me in places like Mexico, Jamaica, and even big cities in the US like Seattle, LA, and New York,” she said. Assuming that you’ll have all the same luxuries abroad that you do in the US. Your overall experience is more important than how luxurious your hotel room is. Just because you are used to having certain things in your home state doesn’t mean that you’ll have those same luxuries when you travel. 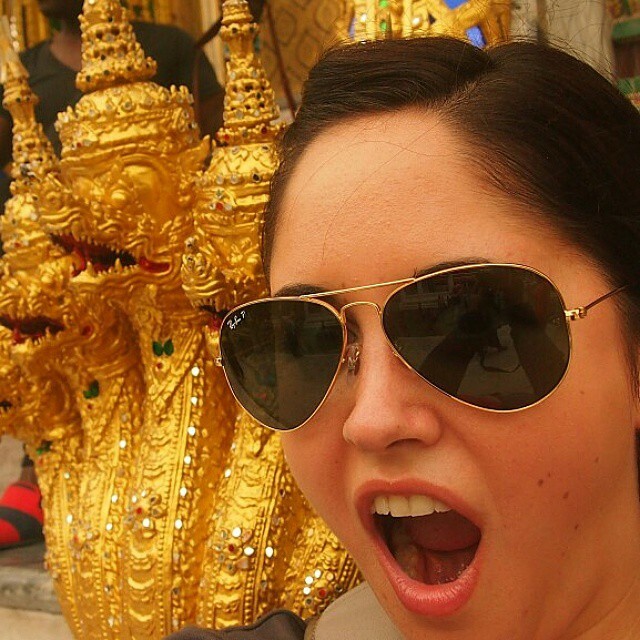 Jen Morilla, also known as The Social Girl Traveler, has lived in five countries, but has traveled to a total of 41. Some places may not offer the same amenities that you’re used to, but that doesn’t mean that you can’t still enjoy them. Commenting negatively on your experience. Some thoughts you’re better off keeping to yourself. Although certain things about the place you’re visiting may not be as great as you’d thought they would be, making negative comments to the people around (especially when you’re not sure where they are from) can be considered rude. Haitian-American traveler Lysnandie Jacques told INSIDER that this was the case for her when she recently traveled to Cuba. “When I was in customs, there was a guy who told me, ‘Wow, I couldn’t imagine living like this. So much poverty here.’ I felt like it was so rude and disrespectful,” she said. Unless you’re around people that you know, avoid making negative comments about your experience. Force yourself to enjoy a sit-down meal. Let’s face it. Americans live a fast-paced life and rarely slow down enough to enjoy their meal. In other countries though, this can be considered impolite. Asking to have food wrapped up. To-go containers aren’t as loved around the world as they are elsewhere. Though widely accepted in the US, some European countries do not take kindly to placing your food in to-go containers. According to Kim-Davy Hoeu, director at KDH Concepts and a French native with an Asian background, it’s really not a common thing. Some restaurants in Europe are starting to accept this, but it can still be frowned upon in certain places. Wearing hats in a restaurant or bar. Hoeu, who also lived in London, told INSIDER that wearing hats can make Americans seem rude when outside of US. “French people would not do this unless maybe sitting on an outdoor terrace or space,” she said. Be sure to survey the area to see if it’s acceptable to wear a hat in the place you decide to dine. Not everyone will sound like you. Though it may be a harmless inquiry, some countries — or people from other countries — find it rude when you ask about their accent and national origin. This may be a good conversation piece in America, but unless a local brings this up for discussion, you may want to steer clear of it. 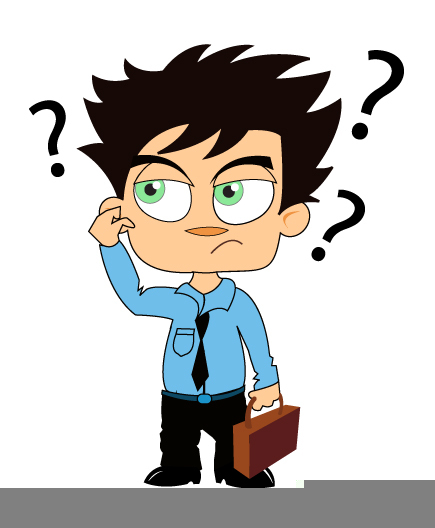 Telling others what you do for a living or inquiring what they do. There’s more to talk about beyond work. In the US, asking someone about their occupation or telling them yours may be casual conversation, but that may not be the case in other countries. New York native and avid traveler Antonio Evans told INSIDER that this topic shouldn’t be your go-to conversation starter. Asking your job within five minutes is rude in most places. Asking for separate checks at a restaurant. Although this has somewhat become the norm in America throughout the years, Heather Grabin, founder of Splash Public Relations and co-owner of Fatty Cakes NY, said that asking to split the bill — especially when you’re in a big group — is ridiculous. IF YOU’VE BEEN traveling long enough, you’ve come into contact with scammers. They’re all over the world: people trying to take advantage of the fact that you don’t know the city and culture you’re in well enough to protect yourself from them. I, personally, have been scammed far more times than I care to admit (Seven. It happened seven goddamn times before I wised up and caught on), and I have to admit: it feels pretty crappy. Fortunately, Just the Flight put together this anti-scam infographic that you can consult each time you leave the country. It includes 40 common scams, as well as the country or city the scams are common in. Under the new policy, an administration official said on Thursday, citizens still may only travel to Cuba for eligible purposes, but they will no longer need a U.S. government license to do so. The government will enforce the policy by investigating suspected violations after the fact, said the official from the Treasury Department, which administers the travel policy. Changing the ban on tourism to Cuba would require an act of Congress, and even with the new policy, travel won’t suddenly be as easy as jetting to Puerto Rico. U.S. citizens will still generally need Cuban visas, obtainable from the Cuban government’s office in Washington, D.C. Still, the new policy could lead to a surge of U.S. visitors to the island beyond the tens of thousands of U.S. citizens who already travel there annually for reasons including family visits, business trips and cultural-exchange tours that are effectively tourist excursions without the beaches. Some citizens, including those with relatives in Cuba, already haven’t had to get U.S. permission to travel there. “This is going to be a significant change,” said Michael Zuccato, general manager of Cuba Travel Services, a Cypress, Calif., company that arranges trips to Cuba. Mr. Zuccato said that under the new rules, his customers would simply sign an affidavit that they are eligible travelers and pay a fee. Mr. Zuccato’s firm would then get the people Cuban visas and they could likely travel there the next day. The change is part of broader moves the White House announced on Wednesday to normalize relations with a country the U.S. has officially embargoed for 54 years. The Treasury Department said it would issue new regulations to implement the changes in the coming weeks. The department official said those regulations would include other changes that ease travel restrictions. The Treasury Department would investigate any suspected violations of its rules on travel to Cuba, the official said. People who travel there should likely keep records to prove they fall into one of the 12 authorized categories. Civil penalties for violating the regulations range up to $65,000. The U.S. has also tightly controlled which companies can provide travel services to Cuba, from travel bookers to companies that arrange flights there. Those companies also won’t need licenses under the new regulations, the official said. Mr. Zuccato’s Cuba Travel Services operates a daily flight from Miami to Havana; roundtrip tickets generally cost $400 to $450. The firm operates another nine weekly flights from Miami to other Cuban cities, and in March is launching a weekly service between Havana and New York’s John F. Kennedy International Airport. 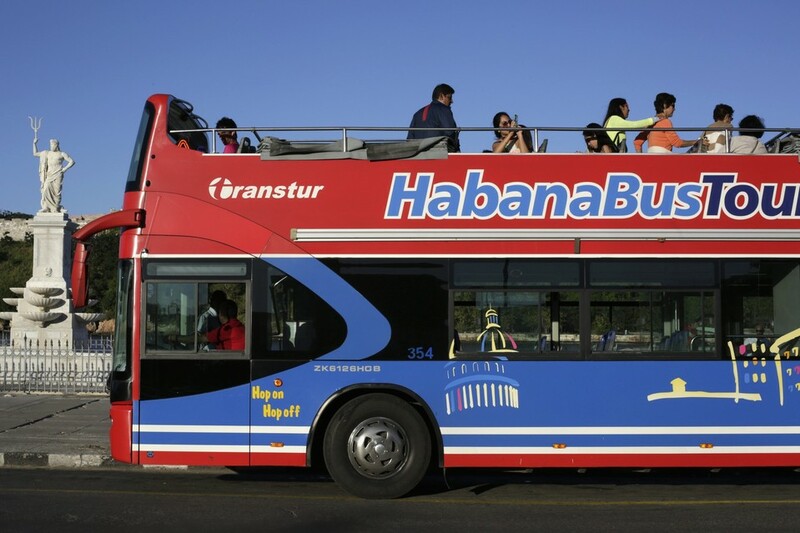 The company expects to fly more than 100,000 people to Cuba in 2014. Michele Gran, vice president of Global Volunteers, which in two years has taken 365 customers on cultural tours to Cuba, said the new rules would remove a big administrative headache. “I’m quite certain that our last application was more than 40 pages,” Ms. Gran said. “We had to account for virtually every hour of every day” to prove to U.S. officials that tour participants didn’t have leisure time for tourist activities. Several tour operators said business has been booming, as they are a way for the adventurous, often wealthy U.S. tourists to see a country that has been off limits for years. A one-week cultural tour can cost roughly $6,000, excluding airfare. But tourists who venture to Cuba shouldn’t yet expect a lavish vacation. The State Department has per-diem limits on how much U.S. citizens can spend there. In Havana, the limits are $100 for lodging and $88 for other expenses. 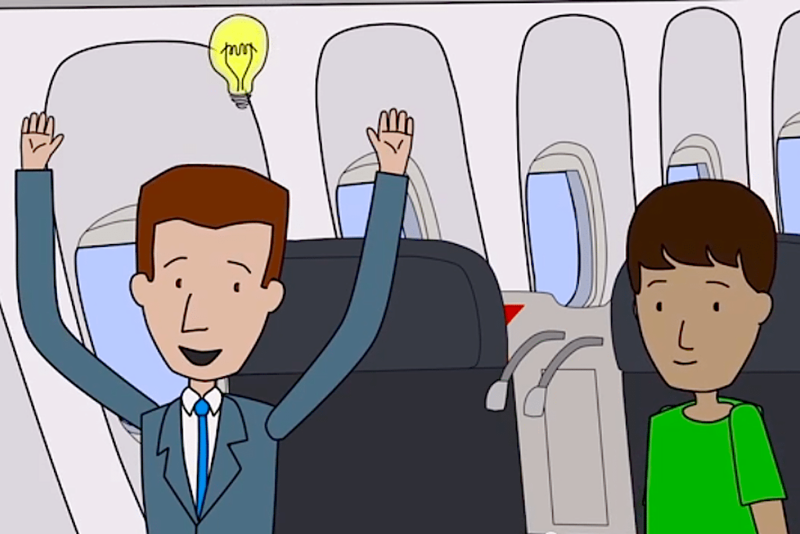 Getting ready for your first business trip abroad can be very stressful! I’ve put together a comprehensive list of items that can help you prepare, hopefully cutting down on your anxiety. The first installment covered passports, travel advisories, and vaccinations. The second installment covered food, transportation, and language. The third installment covered credit cards, currency exchange, points, and cell phone, data, and text plans. The fourth installment covered what to put in your carry-on for the travel. This time we’re talking about time changes, Visas, and Global Entry. Global entry. I’ve talked about Global Entry a lot, and in my experience it deserves every bit of praise it gets. For $100, you get five years of going through a kiosk for customs vs. waiting in the long lines. You also get five years of TSA Pre-check. Even if you only fly internationally once a year I think this is worth it. For those of you that go overseas often it is a must have. Visas. Make sure you take care of any work visas you need BEFORE you leave. Your company travel department should be able to help you determine what documents you need and how to get them. If you don’t have a travel department check the US Department of State website which will tell you need for any country you travel to. Google Earth- When you’re going somewhere you’ve never been, before you leave I recommend finding your hotel and office on Google Earth. Take a look at what’s going to be around you. This will help you find potential restaurants, places to shop for things you may need, etc. It also can help to relieve some of the stress of going to a place you’ve never been before since you can actually see the area where you’ll be going before you get there. Doing this definitely lessens my anxiety before traveling to a new international destination. Of course, if the area looks worse than you expected there is the potential for more stress, so keep that in mind! ONE OF THE most common questions I get when people ask me to help them plan a trip, is how much to tip in a certain country. When I was in Oslo, my waitress told me that tipping is definitely expected in Norway. But while living in Prague, we weren’t expected to leave a dedicated tip, just round up to the nearest koruna. I think the most important thing to remember, is that tipping is not universal by continent — nor is it universal within the country as well. I like this infographic because I feel like it’s really comprehensive, and provides enough information without seeming overwhelming. While I don’t think I’ll ever be the kind of person to not leave a tip, at least I can ask questions to locals in the countries I’m skeptical about, to avoid embarrassment in places like Japan. Image via Visual.ly. Click to enlarge. Every year, Deloitte releases a survey of venture capitalists from a dozen countries. As emerging markets tech investors, the question that always stands out to us is: “What is your overall confidence in investing outside of your home country…?” Year after year, U.S. VCs express the lowest confidence level. This reluctance is especially surprising given certain well known trends, not least of which is the globalization of the Internet. Today, nine out of 10 Internet users reside outside of the United States. The rise of smartphones is set to tilt this balance yet further. Mozilla’s upcoming $25 handset will put smartphones within reach of all but the most impoverished consumers. There are several possible explanations for U.S. venture capitalists’ reluctance to look outside of their domestic market. Tech investors may simply be succumbing to the same home bias that afflicts investors across asset classes. However, certain venture-specific constraints may be at play as well. Many investors believe that physical proximity to their portfolio companies improves their ability to add value to them. It can also take months or even years of effort to build a network in a new market. Logistical constraints are a factor too. It takes at least 10 hours to reach most notable international ecosystems from San Francisco. Finally, the United States has historically accounted for two-thirds of venture-backed exits. Thus, investors often have legitimate reasons to feel more comfortable in their own backyard. Why, then, should Silicon Valley investors go through all this trouble to consider new markets? In short, U.S. tech investors may miss the next wave of major exits. Ernst & Young recently asked global tech executives where they plan to focus their M&A efforts next year. Two-thirds of them expect to allocate the majority of their acquisition capital to emerging markets. When asked why, they said their overwhelming motivator is the desire to gain market share in these fast growing regions. This makes sense. After all, 86% of users of the top 10 Internet properties (Google, Facebook, Yahoo, etc.) now come from outside of the U.S. This growing relevance is intensified by the positive feedback that exits can create for startup ecosystems. After selling their companies, successful tech executives become angel investors, mentors, and leaders of the next generation of great companies. Silicon Valley serves as the best example of this phenomenon. 400 companies and VC firms here can trace their roots back to Fairchild Semiconductor. More recently, early PayPal employees have gone on to found Linkedin, Tesla, Palantir, YouTube, SpaceX, Yelp, and Yammer, among others. The lack of cross-border investment leaves both investors and entrepreneurs shortchanged. Entrepreneurs from Mexico to Dubai frequently tell us that Silicon Valley knowledge, expertise, and resources are in high demand in emerging markets. Silicon Valley VCs have an opportunity to leverage this need in order to access high quality entrepreneurs and help them scale their businesses. The resulting outcomes serve both parties well. The economics of venture capital are set to shift as emerging markets look towards game changing exits. The ramifications of these exits on local ecosystems will be significant. Whether most venture capitalists are positioned to capitalize on this opportunity is less clear. Martin Gedalin and Zach Finkelstein are investors at Lumia Capital. Lumia Capital is an expansion-stage VC partnering with leading tech companies in under-invested emerging markets and forward-thinking US companies targeting these markets to accelerate growth. Follow them on Twitter at @martyged and @zfinkelstein. ON THE SECOND FLOOR of Yay contemporary art gallery, a two-story sandstone structure in Baku, the artist Faig Ahmed is peeling bubble wrap off several medium-size carpets hung in frames. The top half of one rug resembles the centuries-old weaving tradition that’s helped make his native country, Azerbaijan, famous across the Caucasus. Outside, vendors are hawking similar patterns to tourists in the Ichari Shahar, or Old City, a nest of cobbled streets, mosques and caravan stops at the capital’s medieval center. In 2000, the entire walled area was designated a UNESCO World Heritage Site, though gazing toward the palace of the Islamic Shirvanshah dynasty—the gallery’s terrace overlooks the ruin of the royal hammam—one can also see the 600-foot Flame Towers arcing up from the hills ringing the city, three curvilinear structures outfitted with 10,000 LED lights that blaze, at night, like enormous licks of fire. Azerbaijan’s ancient capital curves along a crescent-shaped bay on the Caspian Sea. If the country has a single defining characteristic, it’s an ability to harmoniously absorb diverse cultural influences. Its tangled traffic is comprised of Soviet-make Ladas, Mercedes S-Classes and purple London-style taxis nicknamed “aubergines.” Women like to wear their hair waist-length while men opt for western jeans paired with traditional flourishes: a beard, a skullcap, prayer beads. (Like its southerly neighbor, Iran, the country is predominately Shia Muslim.) 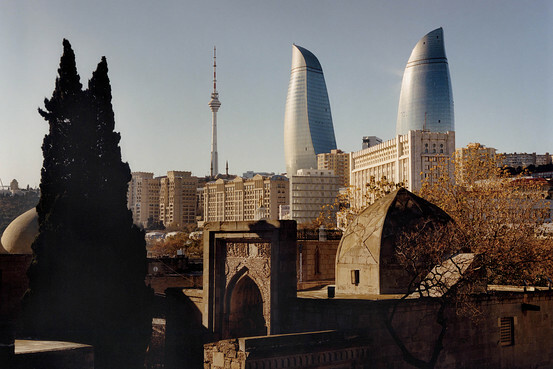 Baku’s spate of recently opened luxury shops—Céline, Dior, Tom Ford —are clustered along a waterfront byway called Neftchilar Avenue that’s also home to fin de siècle oil-boom mansions, Soviet government buildings and an imposing 12th-century stone landmark known as the Maiden Tower. Situated at the base of the Caucasus Mountains, Azerbaijan has been conquered over the millennia by Alexander the Great, the Mongols, the Ottomans, the Persians and the Russians. It has been squeezed between East and West, old and new, Islam and Christianity, Europe and Asia for so long that to say it exists at a cultural crossroads—as people have for centuries—is to resort to cliché. Only during its very recent history has Azerbaijan’s cross-cultural flourishing been put on hold. In 1991, along with most of the former USSR, Baku emerged from more than 50 years of repressive communist rule, an era that replaced the city’s syncretic broadmindedness with monolithic totalitarianism. Since the thaw—and for the second time in its long history—Azerbaijan has been applying its petro dollars to become an economic engine for the region. Its cultural capital is rising, too. Ruled for the past decade by President Ilham Aliyev, who inherited the presidency from his father and one-time KGB general Heydar Aliyev, the current government has been accused of corruption, holding unfair elections and limiting free speech. “Unfortunately, corruption exists in every society around the world and the government of Azerbaijan is making every effort to address this problem in Azerbaijan,” says Fakhraddin Ismayilov, press attaché at the Embassy of the Republic of Azerbaijan. Rights groups and analysts say that much of the country’s corruption is related to revenues from the state-run oil industry—some of which Aliyev uses to fund the ongoing Nagorno-Karabakh War with bordering Armenia. (Other potentially hostile neighbors are Iran and Russia, which has become increasingly assertive in its sphere of influence.) Azerbaijan has taken several concrete steps toward democratic reform, such as joining the Extractive Industries Transparency Initiative, a global coalition of governments, companies and NGOs working to create accountability for revenues stemming from natural resources. It’s impossible to overstate the importance of oil to Azerbaijan. At the turn of the last century, when Baku’s population growth outpaced that of London and New York, the city was a heady blend of European metropolis and Wild West frontier. It was known for its Philharmonic Hall, inspired by Monte Carlo’s grand casinos, which housed the first opera house in the Muslim world. The Rothschilds and the Nobel brothers built opulent mansions underwritten by fortunes made from Azeri oil, as did dozens of Muslim “oil barons,” who aspired to transform Baku into the grandest city in the Islamic world through civic philanthropy. As the writer Tom Reiss details in The Orientalist, Azerbaijan thought of itself as Europe’s easternmost outpost—even if the rest of Europe didn’t necessarily know it. “Even today it is possible to imagine that one has wandered into some unusually sooty Right Bank neighborhood in Paris, mysteriously abandoned by its inhabitants,” writes Reiss. Though efforts to restore the country to its pre-Soviet stature began immediately after the Iron Curtain lifted, the pace of regeneration has hit warp speed in the last few years. On the one hand, the government is pouring millions of dollars into civic improvements, much of it tellingly centered on cultural infrastructure like the recently opened Zaha Hadid–designed Heydar Aliyev Center. 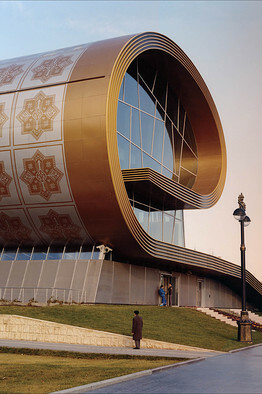 The concert hall and exhibition space resembles a swooping space-age Bedouin tent perched on a hill, its sinuous design a reference to Islamic calligraphy. There’s also the soon-to-open relocation of the State Museum of Azerbaijan Carpet and Applied Art, the design of which evokes a massive rolled-up rug. 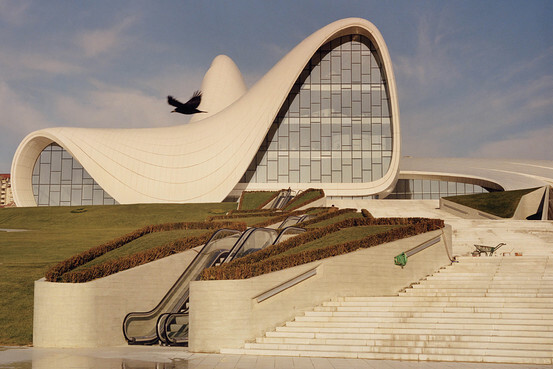 While architectural pyrotechnics like the HOK-designed Flame Towers and the Heydar Aliyev Center—both completed in 2012—serve as bids for international attention, the not-for-profit arts organization Yarat is the force behind the city’s nascent but fast-growing contemporary art scene. Since its founding in September 2011, Yarat has produced an astounding 42 projects, from “Love Me, Love Me Not”—a special pavilion at the 55th Venice Biennale of art from countries that share a border with Azerbaijan, including Iran, Turkey, Russia and Georgia—to a site-specific exhibition of 29 emerging artists housed inside the Baku Air Condition Plant. It has produced a pop-up film festival; collaborations with galleries in New York, Paris and London; and an annual Public Art Festival that last year brought the Dutch artist Florentijn Hofman’s giant globe-trotting rubber ducky, previously moored in Hong Kong’s Victoria Harbour, to Baku. Part of Yarat’s mandate is to promote Azerbaijani artists internationally as well as at home. In September 2012, it helped organize the first Christie’s exhibition in Baku. “It was a combined exercise which showcased international art alongside a very vibrant local art scene,” says Paul Hewitt, managing director of growth markets at the auction house. “It was an important first step of a developing relationship.” Held at the Four Seasons, one of several brand-new five-star hotels in the capital, the show featured works by Picasso, Warhol and DeLempicka and was attended by a troop of high-powered collectors from Mexico, China, Switzerland and India—a bellwether for a city on the verge of becoming an art-world destination for the private jet set. At the same time, Yarat opened the exhibition “Commonist,” with works by its artists, including Ahmed and 18 others. AT THE CENTER of this transformation is Mahmudova, a 32-year-old with a slight gym-toned frame and a broad smile who has become the link between official culture and subculture in Baku. Her aunt Mehriban Aliyeva is the country’s first lady. Her cousin Leyla Aliyeva (Mehriban’s daughter) is the editor-in-chief of the Condé Nast–ownedBaku magazine, a glossy dedicated to all things luxurious in the capital. “The idea [for Yarat] came to me a long time ago, way before I founded the organization,” she says. With her familial wealth and desire to help artists of all generations, she approximates a very young, very glamorous godmother of art. Mahmudova is herself a commercially successful artist. After earning a degree in fashion merchandising from the American InterContinental University, she studied painting at London’s prestigious Central Saint Martins. She says her time in the British capital shaped her sense of how an arts organization in Baku might be structured. But it wasn’t until after she’d finished school in London, married an Iranian entrepreneur and had a daughter, now 3 years old, that she focused her energies on getting the organization off the ground. Though she surely benefits from her family connections, Mahmudova is not involved in politics—and given the controversy surrounding her aunt’s husband, she has every reason to downplay her political connections. She structured Yarat as a not-for-profit, with a creative board made up of artists. Money is raised by petitioning local businesses like banks and telecommunications companies for support, typically for specific projects, like the Public Art Festival, a citywide event that lasts six months and showcases several dozen works of art. Yay gallery serves as the commercial wing of the organization, with half of the profits going to the artist and the other half to Yarat, which employs seven people full time. Last December, Yarat held its first general fund-raiser, a presentation followed by cocktails at the JW Marriott Absheron hotel. According to Davud Gambarzade, Yarat’s international program director, Azerbaijani companies are beginning to recognize that being associated with the arts can have a positive branding effect. Money that once went to chess competitions or sports like wrestling—both popular in Azerbaijan—is now funding artistic patronage. In 2013, Mahmudova was appointed curatorial director of the four-year-old Baku Museum of Modern Art. Next year, she plans to narrow the scope of its rotating exhibition space to focus on Azerbaijani artists, particularly emerging ones, like the 34-year-old painter Rashad Babayev. Babayev’s large-scale canvases use color and shadow to create powerful abstract forms. Schooled as a lawyer, he considers himself “street educated” by an older generation of artists such as Rasim Babayev (no relation), a Soviet-era painter whose politically provocative work became nationally recognized only after his death. “I spent a lot of time speaking with the artistic community, talking with other artists, so I have a kind of training,” says Rashad Babayev. He has been working with Yarat since its inaugural group exhibition, “On Soz”—meaning “forward” in Azeri. The museum is perhaps the least ostentatious example of Baku’s drive to build blue-chip architecture. Though the city’s construction frenzy draws comparisons to Dubai and Abu Dhabi, Bakuvians recoil at the implications: Where those Emirate cities often import a kind of rootless western architecture, Baku’s structures reference the country’s cultural heritage. Even the glittering Flame Towers are a nod to the country’s past as a spiritual center for Zoroastrians—practitioners of Persia’s pre-Muslim religion, who were drawn to the flames that still spontaneously erupt from the landscape thanks to natural gas leaks. Gas is unavoidable in Azerbaijan. The world’s first mechanized rig struck big here in 1871, and by 1901 the country’s fields pumped half the world’s crude. The most powerful gushers were given names, such as Wet Nurse and Golden Bazaar. During Soviet rule, the industry languished, but in 1994, Heydar Aliyev signed the so-called Contract of the Century, a series of deals with multinational energy companies that paved the way for Azerbaijan’s offshore oil fields to be developed, and returned vast, if unevenly distributed, wealth to the county. The opening of the Baku-Tbilisi-Ceyhan pipeline in 2006 and a gradual shift in resources from oil to natural gas are helping to keep the industry strong. Early this year, Yay gallery showed a series of paintings calledGirls Prefer Oilmen by the Russian-born painter Irina Eldarova. The works depict candy-colored versions of Marilyn Monroe demurely flirting with Azerbaijani rig workers. THE AVERAGE ART STUDENT in Baku will graduate with excellent technical skills, learning to sculpt from life or paint in the Soviet Realist style that still dominates academic art. What’s not on offer, however, is the kind of conceptual art that most western schools have favored over the last 50 or so years—art that considers process and ideas and may not even look like art to someone outside the field. There have been unmistakable successes for Yarat: The Venice pavilion; “Fly to Baku,” a traveling exhibition of Azerbaijani artists’ work co-organized by the high-profile Swiss auctioneer Simon de Pury ; “Merging Bridges,” a 2012 show at the Baku MoMA of work by Yarat-supported artists and international names like James Turrell, Idris Khan and Olympia Scarry; and Ahmed, who last year was short-listed for the Victoria and Albert Museum’s Jameel Prize 3 for artists inspired by the Islamic tradition. This month, the exhibition “Love Me, Love Me Not,” which includes work by New York–based Ali Banisadr and the international collective Slavs and Tatars, travels from Venice to the Heydar Aliyev Center’s tiered galleries. At the same time, Yarat will travel to Art Dubai as part of its Marker section, focused this year on Central Asia and the Caucasus. One chilly afternoon, Mahmudova visits the crumbling three-story studio space she shares with Ahmed, Rasulov and other friends. “I’m just very tired constantly because we’ve been working so hard for the past two years,” she says. There are dark stains on the floor where rainwater has overflowed from wineglasses placed beneath leaks in the skylight. Canvases tilt against the graffiti-covered walls. The voice of a man reciting passages of the Koran drifts up from the street outside, where a Muslim funeral is taking place. This is an older, less gentrified section of Baku, where the streets are narrow and difficult to navigate. Mahmudova doesn’t come here very often anymore. She’s set up a studio in her apartment across town, where she can paint in the evenings when the mood strikes her and see her daughter anytime. It’s just as well. Soon, much of the neighborhood will succumb to modernization, making way for a new highway or parkland or gleaming office towers—monuments to Azerbaijan’s future. If you’re visiting the Fluent In ForeignTM Blog and reading this post, more than likely, you are a business owner or manager preparing to expand into foreign markets or looking to grow your business internationally. You are probably acutely aware of the risks and hurdles that come with expanding into the international market; dealing with foreign governments and trade agencies, language, currency and cultural gaps, choosing the right local partners, etc. However, there is another major issue you may not have considered: Medical Coverage. Does your current domestic policy cover you during international business trips? How will your employees working around the globe access the medical care they need? Can your current provider coordinate care for you and your employees in distant corners of the world? Unfortunately, many travelers overlook the importance of having quality medical coverage that travels with them; many times, not realizing the gaps in their coverage, until it’s too late. The truth is, while traditional plans may offer adequate domestic coverage, they are not designed for international travel. Without even realizing it, you may be putting your health – and that of your employees at risk. You have enough to worry about when it comes to your international expansion. Don’t let medical coverage be one of them. To help you avoid this pitfall, Fluent In Foreign has partnered with International Medical Group® (IMG®) to offer a selection of international travel medical insurance plans specifically designed to provide you and your employees the coverage you need, as you expand into the international marketplace. IMG is a leader in the international health insurance market providing medical security to hundreds of thousands of individuals, families and groups traveling and living abroad in more than 170 countries worldwide. For over 20 years, IMG has provided top-tier global health insurance benefits and has developed a reputation of excellence in the international community. With its around-the-clock medical management services, multilingual claims administrators and highly trained customer service professionals, IMG is confident in its ability to provide the products international travelers need, backed by the service they want. The partnership between Fluent In Foreign and IMG will allow you to, quickly and conveniently, select a policy that fits your needs and one that will travel with you, wherever the growth opportunities demand. Moving onto the international stage and expanding your business into new markets can be an exciting and possibly daunting process. Make your medical security, and that of your employees, one less thing to worry about, by getting Global Peace of Mind® from IMG. Turkish Airlines will soon launch an initiative that delivers hand-picked, in-flight startup pitches to investors. The Invest on Board program will be run by eTohum, a platform launched in 2008 that will vet and choose participating startups. Flyers seated in Turkish Airlines’ Business Class can watch the videos on their in-seat TVs. There are currently eleven videos on the Invest on Board website, where founders can also apply to have their pitch shown to Turkish Airlines’ customers. As writers for an international blog we travel a lot. We hold our conferences in Amsterdam, Sau Paulo and New York now but have also held smaller events in lots of countries across Europe and South America. We’ve seen our fair share of airports and hotels and have our own little tricks and tips for geek traveling. (Disclaimer: I happen to be a Mac user so some of the tips are more useful for Apple users than non-Apple users. Sorry about that). When I travel I bring a laptop, my iPad and my iPhone. Every device has a charger that needs to be plugged in somewhere. You can buy the Apple World Travel Adapter Kit, but that is expensive and has a bunch of adapters you will likely never use. Years ago I started collecting these little thingies you can attach to your power adapters. I got a few British ones, about 5 US ones and a bunch of European ones. Now when I travel somewhere I find out what power sockets are used for that country and then replace all my adapters with the right add-on. Another smart option is to bring a basic 5-Outlet Power Bar Strip Splitter with you with just one international converter. That way you can keep your local power sockets attached and use just one plug. Many hotel rooms only have one power socket near the bed, so this is a very efficient way to connect all your devices, and not worry about finding a converter for every device you carry. If you end up forgetting your adapters (it happened to me) just go and talk to the hotel reception. Ask them to check the ‘Lost & Found’ basket if they don’t keep an extra adapter behind the desk. A lot of travelers forget theirs (it happened to me) when they leave the room, so usually they have a whole basket filled with these things somewhere. The other thing I always bring is an ethernet cable. If you have a newer MacBook Pro or MacBook Air, you might need an extra Thunderbolt adapter, so get one of those too. Some hotels offer free wired networking and paid WiFi, so then an ethernet cable comes in handy. I’ve also had instances where the WiFi was down but the network still worked. If I’m traveling longer I bring my own Airport Express station which I can connect to any network and then use to set up my own WiFi network. This is handy for hotels that have ethernet but no (or bad) WiFi network in your room. I name the network ‘TheNextWeb.com’ for some extra guerrilla marketing. These days the better hotels all offer a large LCD TV in your room. So far I have always been able to reach the back of these things and attach my own Apple TV via an HDMI cable. In the US, you can also order a Google Chromecast which is even cheaper and works just as well for streaming. WOULD YOU TRAVEL ABROAD… NAKED? No, you probably would not. Yet, if asked “Would you travel abroad without travel healthcare/medevac insurance?” a good number of you would also say “NO”. Not having medical insurance when traveling abroad certainly leaves you exposed and vulnerable. Yet, just having medical travel insurance is often not enough…. What happens if while abroad you become very ill, are involved in an accident, or suffer food poisoning, heat stroke, or severe allergic reaction. Chances are doctors treating you would want to access your health information prior to treating you. More often than not, business travelers are not accompanied by their family members who know their medical history and very few of us carry our medical records while traveling. Until recently, only folks with chronic medical conditions or severe allergies or wore bracelets which alerted emergency medical workers in the event patients could not communicate as result of accident or illness. The rest of us mostly left things to chance. Conversely, and much more likely than getting seriously ill, or being involved in an accident, how many of us get stomach flu, catch colds or contract an untold number of travel related ailments from heat strokes, mosquito bites and food poisonings, while traveling abroad. How many times you wished you could easily communicate with your Doctor despite the time zones and get some much-needed advice and informational therapy? Over the last few months we have been testing a brand new platform called HealthKnight™ as the way to leverage technology for international travel. At this point it is an invitation-only full-blown social network and information platform designed exclusively for healthcare and wellness management. Starting August 15th, Fluent In Foreign™ will have an exclusive group on the HealthKnight® platform dedicated to the needs of international business travelers (www.fluentinforeigntravel.com ). Members will be able to store their health records in a secure HIPAAA compliant manner, yet easily access or share them while abroad. Members will also be able to easily and privately communicate with their own healthcare professionals, or reach out to other doctors in various countries. The Group’s members will also be able to share own experiences and speak online to guest moderators – experienced travelers, doctors, insurance professionals. and celebrity personalities Best of all the entire service is free of charge. International business is difficult enough and we need to minimize risks every place we possibly can. You would not travel abroad naked, but why would you play Russian roulette with your life and travel unprotected? Good trip preparation helps reduce the need for medical care abroad. Short-term travelers are most concerned about emergency medical care; expatriates and long-stay travelers may have different health-care needs. Travelers with an acute medical or surgical emergency should seek the nearest facility for immediate care. Most of the time this care will be adequate. Most travelers should purchase a travel insurance policy that includes assistance benefits. An assistance company can provide referrals to English-speaking physicians, monitor health care, and arrange emergency medical evacuation, if those become necessary. Medical care abroad varies widely, and in many countries is of high quality. This high-quality care, however, may be available to only a small segment of the general population. Travelers should find out how to locate this care. All travelers should carry at least a basic medical kit. They should have their own supply of pain medication, antibiotics, drugs for diarrhea, heartburn, etc. This can help avert a trip to a doctor or hospital. Travelers should consider carrying a mobile phone that can make international calls. They should bring with them their personal physician’s office telephone, mobile phone, and fax numbers and e-mail address so the traveler, or his family, and/or the physician overseas will be better able to assess the medical problem. What do you do if you are suddenly taken ill or have a serious accident in a foreign country? How do you find an English-speaking physician? Or locate a reputable hospital? Where do you turn for help and advice? The first step in avoiding disaster is prevention. This means careful pre-trip planning as outlined in this Health Guide. But what if an unexpected illness or accident occurs? Statistics show that 25% of travelers develop some type of medical problem over a 2-week period. Most accidents and cases of medical illness are relatively minor. The problem may be self-evident. Most conditions resolve by themselves or can be treated with simple first-aid measures or with the medication you have on hand. But what if you need a physician’s treatment or hospitalization? When an emergency happens far from home, even a seasoned traveler may have trouble coping, especially if medical care is urgently needed. What starts out as a routine vacation or business trip could end up as a real nightmare. Stay Calm You may be able to solve the problem yourself. You may already have medicine with you to treat a minor infection, a rash, a cut, a bruise, or a sprain. If diarrhea should occur, follow the treatment guidelines for travelers’ diarrhea in Chapter 6. Check to see what’s in your medical kit. Home health-care guides and first-aid manuals are sources of useful advice, so you may wish to bring one of these with you. Serious Accidents or Illness Demand Immediate Attention If you sustain a more serious injury, such as a deep laceration or a fracture, or have bleeding, unremitting chest or abdominal pain, or trouble breathing, don’t waste your time trying to find a local physician. Go immediately to the nearest hospital. If you are in a large city, go to a hospital associated with a medical school if possible (these hospitals usually have English-speaking doctors as well as qualified specialists on staff). You can ask for directions or assistance from your hotel, your tour guide, a taxi driver, or the police. A taxi or private car may be faster than waiting for an ambulance. Remember, in an emergency, minutes count. Don’t delay! Note: If you think you are having a heart attack, early diagnosis and treatment are critical. Administration of a thrombolytic (clot dissolving) drug, or angioplasty, will greatly improve your chance of survival. Less Urgent Illness This can usually be treated during a daytime visit to a doctor’s office, but some doctors will make an after hours hotel “house call.” Your hotel can usually provide the names of one or more English-speaking physicians. Better yet, if you have friends, relatives, or business associates who are residents of the area, ask them for a referral to a doctor they know is qualified. Colds, sore throats, ear aches, bronchitis, diarrhea, most urinary infections, and the flu are some of the conditions that usually don’t require emergency attention, but do require monitoring and possible physician follow-up. You won’t find overseas the widespread availability of over-the-counter drugs there is in the United States and Canada; so bring your own supply of antibiotics, pain medication, diarrhea pills, etc. The medication you bring may cure or sufficiently ameliorate the problem or make you feel better while waiting to see a physician. You can take levofloxacin (a standby antibiotic for travelers’ diarrhea) for painful, frequent urination (urinary tract infection?) or a cough with fever (pneumonia?) pending further medical evaluation. Self treatment with an antimalarial drug is a good example of how self medicating can be potentially life saving. However, if you do have a fever that might be from malaria, be sure you are examined within 24 hours. Request that all medications you receive from the doctor be identified or labeled with the generic as well as the trade name. This is important if you have drug allergies and must avoid certain medications or if you develop a drug-related reaction or have to see another doctor for ongoing care. That doctor will need to know what drugs you have been taking. Note: Familiar drugs will have different brand names in other countries, but generic names may also vary. For example, acetaminophen (Tylenol) has another generic name, paracetamol, in some countries; and meperidine (Demerol), is sometimes generically identified as pethedine. Bring a Medical Kit and First-Aid Manual You can often save yourself a trip to the doctor if you are able treat cuts, abrasions, and other minor injuries yourself. Be sure your routine immunizations are up-to-date so you don’t have to go to a hospital for a tetanus booster. Carry a Phrase Book A phrase booklet or pamphlet that provides medical words and phrases in various foreign languages, or the KwikPoint medical visual language translator (www.kwikpoint.com), can be invaluable when a language barrier prevents the adequate communication of immediate medical needs. Find an interpreter as soon as possible. Contact Your Doctor in the United States Bring a mobile telephone with you on your trip. If you are hospitalized, a consultation with your own physician back home can be invaluable. Hopefully your doctor, or an associate, will be available at the time you call. (Leave your number, or another call back number, if necessary.) Describe the history of your illness, your symptoms, what the diagnosis is, and what treatment you are receiving. Let your doctor know if you are in a country where there are tropical diseases. Have your own doctor discuss your case with the local doctor caring for you. Obviously, for certain conditions, treatment is standard and straightforward—surgery for appendicitis, casting for fractures, etc.—and your treatment may have already been rendered. However, for more serious or life-threatening problems, this consultation can be important. Your diagnosis may be in doubt, and the hospital and physician may not have the expertise to provide adequate care. Your physician can help assess the situation and reassure you that you are receiving proper care and that there’s no need to worry, or your physician may feel that a second opinion is warranted or even that transfer to another facility is advisable. Travel Insurance/Assistance Companies If you have purchased a travel health policy, call the 24-hour hotline number and you’ll be connected with an assistance center that can give a physician referral. Companies such as International SOS Assistance and Shoreland, Inc. (publisher of Travax EnCompass), provide corporate and travel physicians, for a fee, with a list of worldwide medical facilities and contact information. International Medical Clinics Because of globalization, there is a growing market for Western-style medicine* to serve the medical needs of the employees of multi-national corporations, visitors, expatriates, and insured travelers. These clinics, usually part of a chain, are found in large cities and may provide the best first contact for any medical problem. One such provider is the American Medical Centers that maintains clinics in Moscow, St. Petersburg, and Kiev. International SOS and MEDEX run clinics in Beijing and many other locations throughout the world. 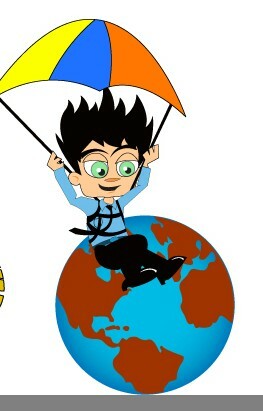 IAMAT The International Association for Assistance to Travelers (IAMAT) is a Canadian foundation that publishes a booklet listing hospitals and English-speaking physicians who have agreed to adhere to a standard schedule of fees. Physicians are not listed by specialty. Contact IAMAT (www.iamat.org), 417 Center Street, Lewiston, NY 14092; 716-754-4883; in Canada, 40 Regal Road, Guelph, Ontario, N1K 1B5; 519-836-0102; no charge, but a donation is encouraged. Cardholder Assistance Credit-card companies provide 24-hour emergency medical hotlines available to many of their cardholders, usually those in the “gold card” or “platinum card” category. Typically, the hotlines can refer you to English-speaking doctors and dentists and to hospitals with English-speaking staff members, arrange for replacement of prescription medicines, and help you charter an air ambulance. If you are an American Express cardholder, call the Global Assist hotline at 800-554-AMEX (301-214-8228 collect from overseas). If you are an American Express Platinum cardholder, call your special assistance number, 800-345-2639 (202-331-1688 collect from overseas). Visa Gold and Classic cardholders can call 800-332-2484 (410-581-9994 collect from overseas). MasterCard cardholders can call 303-278-8000 (collect from overseas). Hotel and Resort Doctors Most large hotels will refer you to a local doctor or to a doctor who will come to your room to render treatment. Be warned, however, that the main qualification some of these doctors have is a payback arrangement with the hotel management. They may be helpful in providing referrals. The Telephone Book You may find many doctors and clinics listed in the “yellow pages” of the local telephone book. These physicians often mention their qualifications and some may indicate that they have received specialty training in the United States, Canada, the United Kingdom, or other medically advanced country. Personal Recommendation A time-tested method of locating a qualified physician (assuming time allows it) is to find a satisfied patient. Ask locals for personal recommendation. Contact employees of multi-national corporations or expatriates such as schoolteachers, relief workers, or missionaries who may have received medical care in-country. They are often familiar with high-quality private general hospitals or specialty clinics. Because of cultural differences, the attitude of physicians toward their patients in foreign countries is often different than in the United States or Canada. Physicians abroad are often perceived as being more autocratic and authoritarian. This can make patient-doctor communication difficult. The doctor caring for you may not want you to question his or her care and may not be available to answer your questions (to be fair, this can sometimes be said of American physicians also). This does not mean that your care is substandard. In fact, the doctor caring for you may have more knowledge of local diseases than your own physician and be perfectly well qualified to diagnose and treat your illness. Nevertheless, you should seek a second opinion if you have doubts about the quality of your care. Foreign hospitals can range from basic to the most advanced, but the quality of your medical care shouldn’t necessarily be judged by your surroundings. If you’re hospitalized in a less developed country, you might wonder if you should be moved to a “more modern” facility. This question faces hospitalized patients everywhere, not just travelers overseas. An analogy to being hospitalized in the United States might be appropriate. In the United States, the smaller community hospitals are adequate for almost all medical care. Occasionally, however, a patient requires transport to a specialty center for advanced, sometimes life-saving treatment. The same is true overseas. You may be in a small, seemingly inadequate facility that may, in fact, be perfectly adequate for your medical needs. Having someone available, in serious situations, to assess your diagnosis and treatment will help you or your family know when transfer or medical evacuation may be indicated. If you need emergency care and minutes count, go to the closest facility. However, if the situation is not immediately critical—and there’s more than one hospital nearby—use the following checklist to get a basic idea of what level of care is available to you. The checklist will also help you tell your doctor at home, if the occasion arises, what services are being provided. Does the hospital have a coronary care unit, ICU, recovery room, and advanced resuscitation and diagnostic equipment? What medical and surgical procedures can be performed? Are orthopedic surgeons, neurosurgeons, and other specialists on staff? If not, where is the closest referral facility? Can they treat heart attacks with thrombolytics (clot-dissolving drugs), angioplasty, stenting, or cardiac bypass surgery (CABG)? Can the hospital render qualified obstetric and postpartum care? Do they have a renal dialysis service? Are computed tomography (CT), MRI, and ultrasound available? Does the hospital or clinic stock disposable supplies, especially needles and syringes? Does the blood bank screen for HIV, hepatitis B antigen, and hepatitis C antibody? What vaccines are available (e.g., tetanus, rabies, rabies immune globulin, hepatitis B, hepatitis B immune globulin)? Is the hospital air-conditioned? Are there private rooms? What types of meals are served? Are private duty nurses available? Does the hospital have 24-hour admitting capability? Does the hospital have an emergency room, receive ambulances, and treat major trauma? Do most of the doctors speak English? What are the room rates and the charges for various medical and surgical procedures? Qualified medical consultation has determined that local medical care is not adequate. Another facility, one that can provide a higher level of care, is available and accessible, and has accepted the patient in transfer. The patient’s condition has been sufficiently stabilized before transport. The patient can pay the cost of the transport. *Western-style medicine has three main components: (1) evidence-based medicine; (2) quality assurance; and (3) patient- centered delivery of care. Evidence-based medicine means practicing medicine using diagnostic and treatment protocols that have been developed through research, not handed down from generation to generation.